Bihar Vidhan Sabha Recruitment 2018 - Apply Online for 101 Junior Clerk, Assistant & Other Posts in Bihar Vidhan Sabha, Bihar on Direct Recruitment. 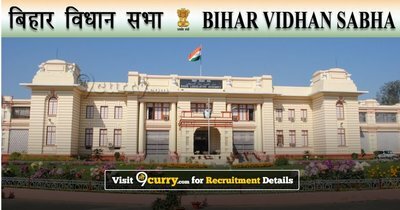 Online Applications are invited by Bihar Vidhan Sabha from 09 Oct 2018 at 11:00 AM to 31 Oct 2018 till 05:00 PM for 101 vacancies. Bihar Vidhan Sabha Junior Clerk, Assistant & Other Post Admit Card 2019: Bihar Legislative Assembly has issued the Admit Card on 01 Apr 2019 for Bihar Vidhan Sabha Junior Clerk, Assistant & Other Post Mains Exam 2019. Bihar Vidhan Sabha Junior Clerk, Assistant & Other Post Typing Test Admit Card 2019: Bihar Legislative Assembly has issued the Admit Card on 05 Feb 2019 for Junior Clerk, Assistant & Other Post Typing Test Exam 2019. Bihar Vidhan Sabha Junior Clerk Admit Card 2018: Bihar Legislative Assembly has issued the Admit Card on 01 Dec 2018 for Bihar Legislative Assembly Junior Clerk Exam 2018 and Other Posts Admit Card is released on 05 Dec 2018. 17 Intermediate Pass from recognized Board/ Institution. Assistant 54 Graduate Degree in any subject from recognized University. Assistant Search / Reference 08 Post Graduate Degree in any subject from recognized University. Assistant Library 10 Post Graduate Degree in any subject from recognized University. Urdu Assistant 02 Graduate Degree in any subject but one subject in Urdu Compulsory from recognized University. Urdu Translator 02 Graduate Degree in Hindi but one subject in Urdu Compulsory from recognized University. Translator (Hindi/ English) 02 Graduate Degree in Hindi but one subject in English Compulsory from recognized University. Assistant Invaluable 06 Graduate Degree in any subject from recognized University. On the basis of Computer Based Examination. Eligible candidates may apply online at Not Available's website (direct link is given below) from 09 Oct 2018 at 11:00 AM to 31 Oct 2018 till 05:00 PM.